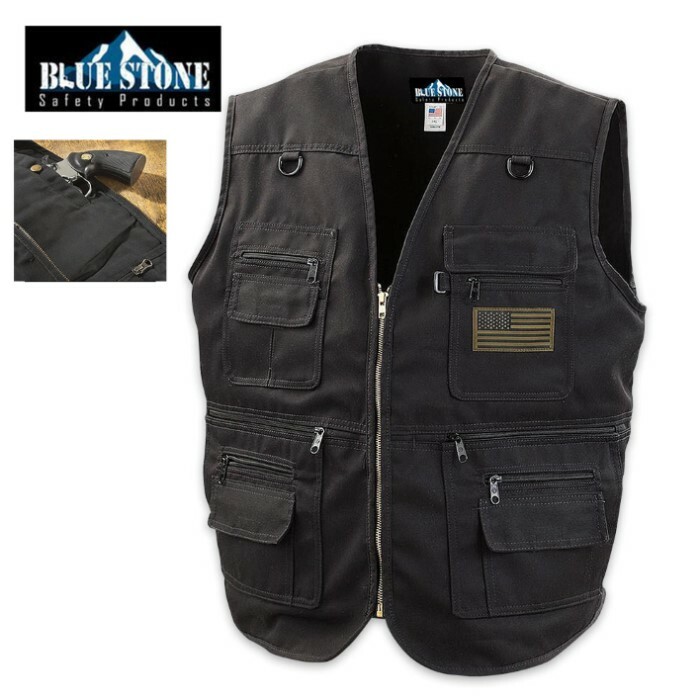 Blue Stone Black Concealment Vest | BUDK.com - Knives & Swords At The Lowest Prices! This quality garment won’t let you down! Specially designed gun pockets will accommodate both left and right hand shooters. This concealment vest is made of durable 80% polyester and 20% cotton and will hold mid to full-size and sub-compact handguns. 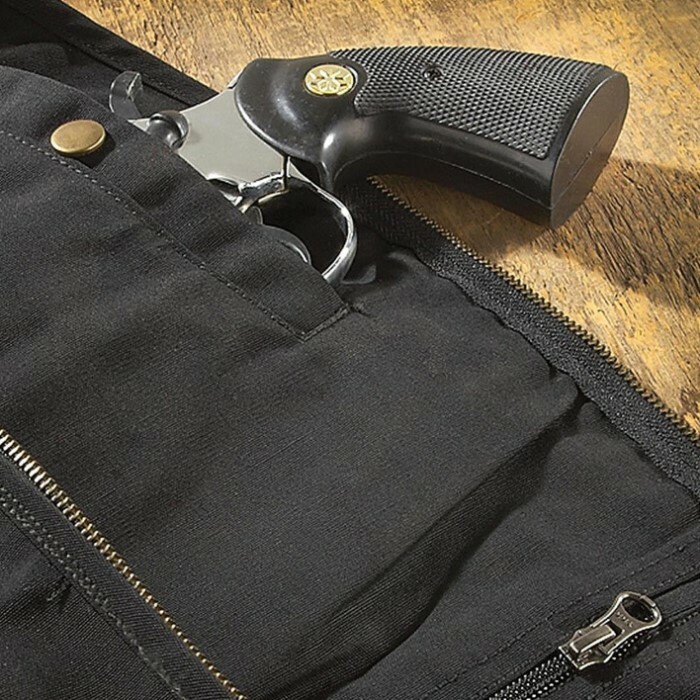 It features concealed carry pockets that are made from tough 1050 Denier Cordura fabric. 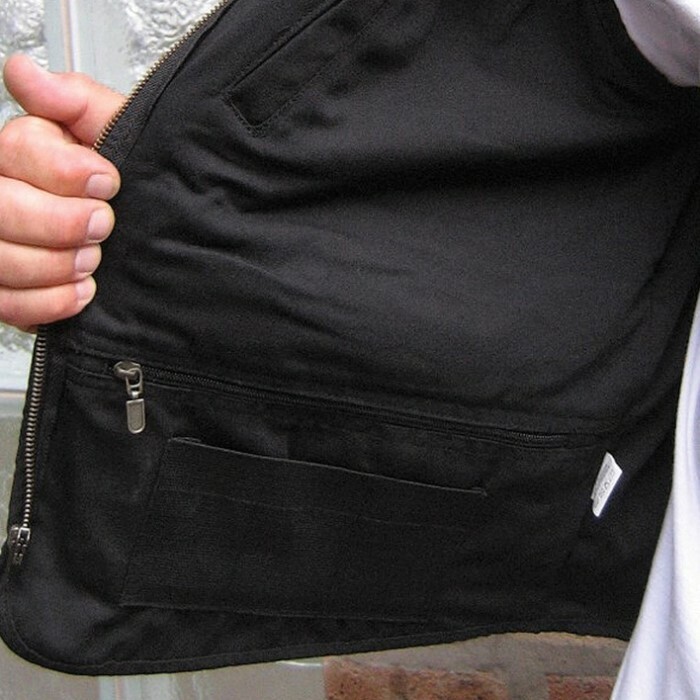 The two inner gun pockets have built-in elastic that holds your weapon for fast draw. There are 12 additional pockets capable of holding up to six extra magazines, plus, a spot to carry extra bullets for a revolver. It comes in medium, large and 1XL. I've owned a Blue Stone vest for a few years now and I have been extremely happy with their product! The gun pockets have a lot of room so they can fit most handguns ( I think it goes as deep as 10.5 inches!) and it also has an elastic strap inside of the gun pocket that works perfectly for smaller guns like my Glock 42; that way my firearm is easily within reach and I'm not digging through the pocket. I also really like the snap on the gun pockets that keeps my Glock from falling out if I bend over or something. I haven't needed to fill all 6 mag pouches yet, but it's nice knowing I have room for them if I need them. The other zippered pockets are very nice too, with zippers that seem very durable with no snags so far. Overall the product has aged well and I'm satisfied.